Bad news, Zelda fans. The next game won't be out this year, Nintendo just announced—they're "no longer making a 2015 release [their] number one priority" for the upcoming Zelda Wii U. Series producer Eiji Aonuma announced the bad news in a video message on Facebook, where he talked about how the team has "discovered several new possibilities for the game" that has led them to no longer prioritize releasing the Wii U's big Zelda in 2015. Like just about every other console Zelda game before it, Zelda Wii U is getting a huge delay. They're not showing it at E3, either. Hello, Zelda fans! I am Eiji Aonuma, producer of The Legend of Zelda. I'd like to share with you an update on our development process on The Legend of Zelda for Wii U. Since I declared at The Game Awards in December that the game would launch in 2015, the directors and the many members of the development team have been working hard developing the game to make it the best it can be. In these last three months, as the team has experienced firsthand the freedom of exploration that hasn't existed in any Zelda game to date, we have discovered several new possibilities for this game. As we have worked to turn these possibilities into reality, new ideas have continued to spring forth, and it now feels like we have the potential to create something that exceeds even my own expectations. As I have watched our development progress, I have come to think that rather than work with meeting a specific schedule as our main objective, and releasing a game that reflects only what we can create within that scheduled time, I feel strongly that our focus should be to bring all these ideas to life in a way that will make The Legend of Zelda on Wii U the best game it can possibly be. 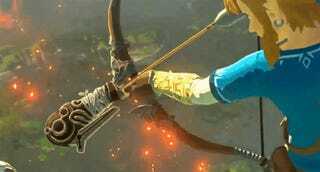 The upcoming Wii U Zelda game, which still has no official title, was first shown off at last year's E3, then again at the Game Awards in Las Vegas late last year, where Aonuma and Nintendo's Shigeru Miyamoto both vowed that it was coming in 2015.